pinkish blue flowers in mid to late Summer. They provide quick covers for lattice, trellis, arbor and chain-link fence, and are a favorite food source for butterflies. Unfortunately, Butterfly Pea plants are only hardy in USDA zones 10-11, but because they are such fast growers they are often grown as an annual plant in colder regions. 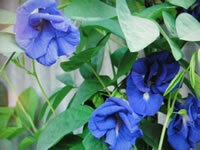 Butterfly Pea seed pods are edible and tasty. The seeds of the Butterfly Pea should be nicked or filed, then soaked overnight in room temperature water before planting. They can be sown directly in the garden with 3-4 inch spacing when the soil warms in the spring. Start seeds indoors 12 weeks before the warm weather arrives, maintaining a temperature within the growing medium of 70°-75° F.